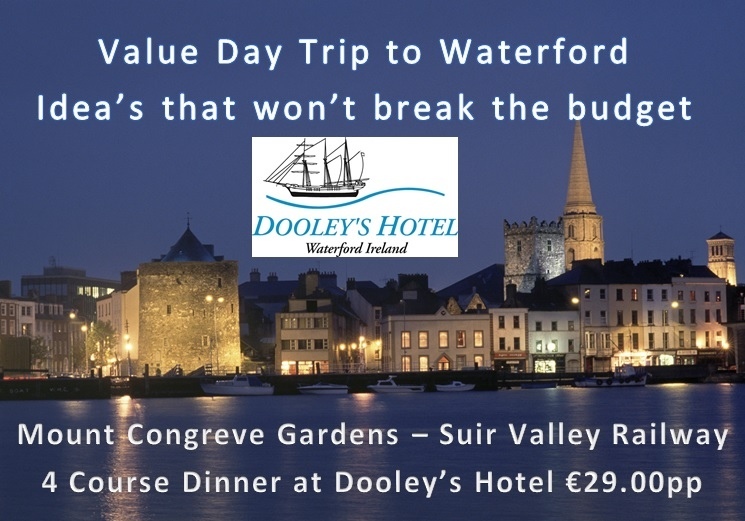 For all nature enthusiasts, these stunning gardens near Waterford are well worth a visit. They provide a break from the hustle and bustle of everyday life and allows the visitor to relax and unwind in beautiful natural surroundings. A day trip to one of these gardens is perfect for families, couples or a group of friends. The Gardens are an ideal space for a leisure walk in a magical setting. The owner, the late Mr. Ambrose Congreve, was inspired by Mr. Lionel de Rothschild’s exceptional garden at Exbury in Hampshire, England. The Gardens at Mount Congreve in Waterford, have an impressive seventy acres of intensively planted woodland garden and a four acre walled garden. The Gardens are home to over three thousand different trees and shrubs, more than two thousand Rhododendrons, six hundred Camellias, Six hundred Conifers, three hundred Acer Cultivars, Two hundred and fifty climbers and fifteen hundred herbaceous plants. Dedicated to the memory of U.S. President John F. Kennedy the 623 acre garden contains 4,500 types of trees and shrubs from all temperate regions of the world, planted in botanical sequence. There are 200 forest plots grouped by continent. Special features include an Ericaceous Garden, dwarf conifers, hedges, ground covers and climbing plants. The lake is the most important part of the Arboretum, and is a haven for waterfowl. There is also a road which provides access to the spectacular viewing point on Slieve Coillte from which there are panoramic views of six different counties. The Visitor Centre provides exhibitions and audio visual show. Daily - All year, except Good Friday and Christmas Day: October - March daily 10am - 5pm. | April 10am - 6.30pm: May - August: 10am - 8pm | September: 10.am - 6.30pm: | Last Admission is 45 minutes before closing. |Closing times alter depending on the time of year. Admission Charge: Adults €5; Child/Student €3; OAP/Group €4; Family €13. Teagasc, the Agricultural and Food Development Authority, is the owner of the Johnstown Castle estate and has a research facility on site. The Spectacular ornamental grounds surrounding the 19th century Castle were designed by Daniel Robertson who is famed for the gardens at Powerscourt in Co. Wicklow. The estate is also home to The Irish Agricultural Museum. The museum housed in the former farm buildings of the estate was officially opened by President Hillery in 1979. The display is around 1,600 square metres of gallery space and attracts around 10,000 visitors per year. Guests can stroll through the grounds with over 200 varieties of trees and shrubs, View the ruins of Rathlannon Castle, Enjoy a picnic in the sunken Italian garden or museum Courtyard or relax by the castle lakeside with its gothic towers, waterfalls, statues and peacocks passing by. Sion Hills peaceful historical gardens offer a green oasis of tranquillity and are conveniently located only a short distance from the city centre. The Mature trees in the garden beautifully frame the stunning panoramic view of the city and river. The gardens are over 250yrs old, with the pathways around the large antique fountain restored to their former glory using an 1870 plan of the house and gardens. The 5 acres is divided into formal areas to the east of the house with parkland and woodland walks to the South and West. Known as the most romantic garden in Ireland, Altamont is an enchanting blend of formal and informal gardens located on a 100 acre estate. It ranks in the top ten of Irish gardens and is often referred to as ‘the jewel in Ireland’s gardening crown’. Lawns are bisected by sculpted yews sloping down to a romantic lake surrounded by rare trees. A fascinating walk through the Arboretum, Bog Garden and Ice Age Glen with its canopy of ancient oaks leads to the majestic River Slaney. Along the River Walk, you may see salmon and trout rising, perhaps even an otter, and throughout the garden, an abundance of birds and butterflies. On your return via the Hill Walk, there are wonderful views of the Blackstairs and Wicklow Mountains and Mount Leinster.